A few weeks ago I was parking at a lay-by on the Snake Pass road in the Peak District. 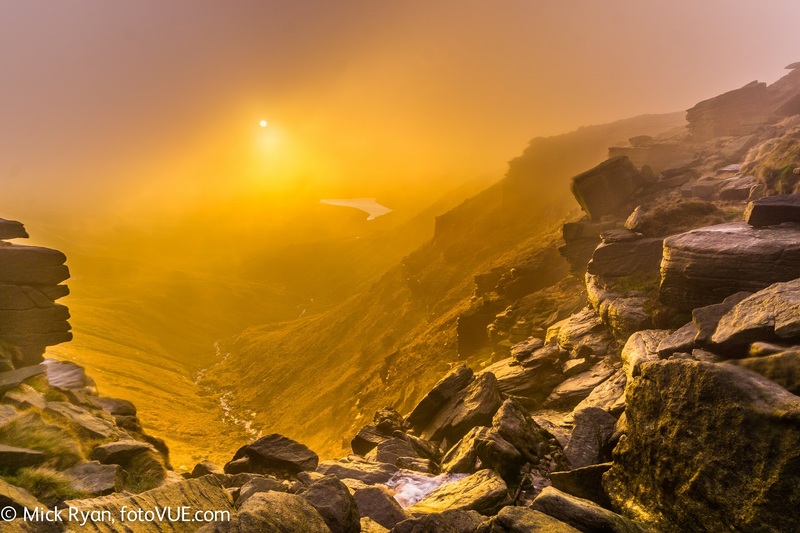 It was around 4pm and my plan was to take advantage of the changing weather – a mix of clouds, rain and sunny spells, with hopefully some rainbows – and take photographs on the way up Blackden Clough, a steep ravine that leads to the Kinder Plateau, and then head over to the 60ft waterfall of the Kinder Downfall for sunset photography. 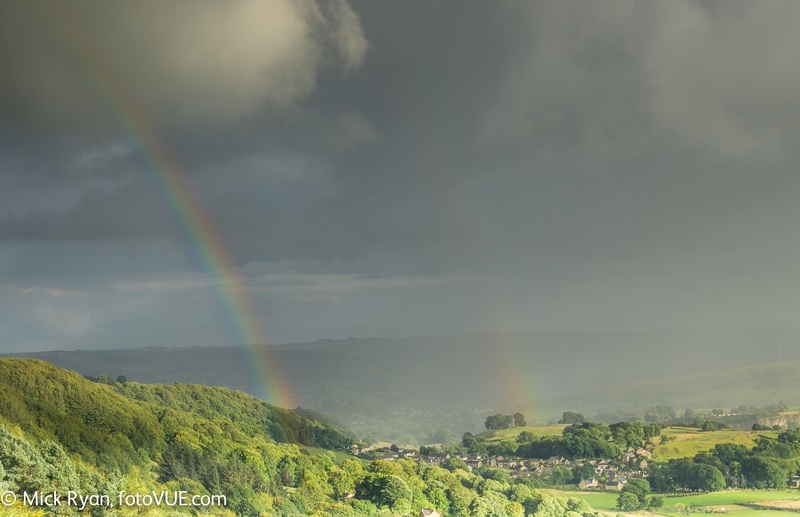 A stormy late-afternoon above the villages of Eyam and Stoney Middleton, Peak District. 2016. When many people are walking off the hill, I’m heading up; when most people are hiking up, I am skipping down. After being obsessed with rock climbing for most of my life, I’m now addicted to landscape photography – just another excuse to be outside. 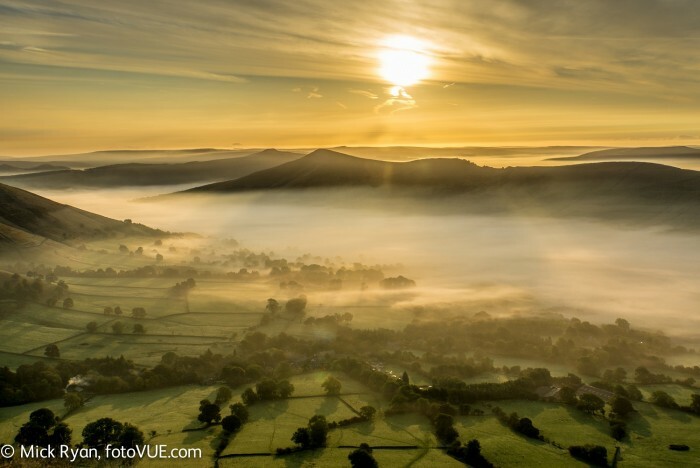 The best times for landscape photography, and I would argue, going out for a country walk or a stomp up a hill, is at dawn and around sunset, and when the weather is changeable. These times are when you get the best light, not just for photography but for enjoying the land at its most splendid. Watching the sky and clouds turn red and orange as the glowing sun creeps up to the horizon and then watching it bathe the slopes of hill and the crags in golden light feels like a religious experience. It’s even better if there is a morning temperature inversion, when cold air near the ground is trapped by warm air above. 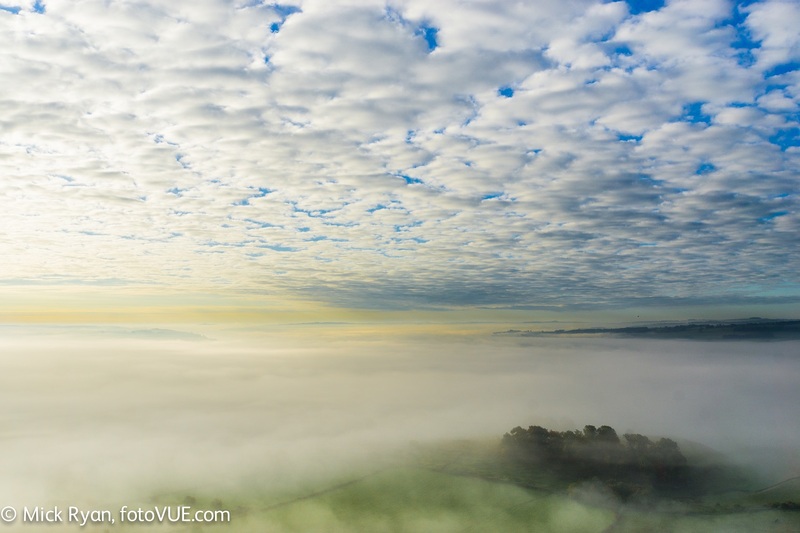 If this occurs in a valley you look down on layers of mist swirling around just above the valley floor. When the clouds are rushing in from the west and squalls of rain drench you, crepuscular rays light up patches of the land and rainbows are common, you may get wet, but by jolly it’s worth being out there. Looking toward Manchester from the top of the Kinder Downfall, Peak District. 2016. It’s hard to think of words to describe how you feel when conditions are good: celestial, spiritual, uplifting, awe-inspiring, energised, other-wordly – although it’s not, it is of this world, but one that most don’t experience. It gives you a new perspective to see such beauty, it becomes addictive and though it may be hard to believe, the early starts become pleasurable, the walk downs in the dark mesmerising. Summer is the most brutal time with the sun rising just after 4am and setting close to 10am. My strategy is either to camp at the trailhead and get an early start or wild camp up high. Wild camping or bivouacking has the advantage that you can catch both sunset and sunrise from up high. After a siesta set off late afternoon, pitch camp and witness the sunset, then up early for sunrise. Even when at home working I now rise before the dawn and head out, then back for breakfast and work; the evening sees me head out a few hours before sunset to catch the best of the day. Good conditions are not always guaranteed at daybreak and the day’s end. You find yourself becoming a weather geek constantly checking the Met Office and BBC weather websites, monitoring where the sun is rising and setting on the compass at suncalc.org, and studying maps for the best places to be. The hours may be unsociable to many, but once you take the plunge, there is no turning back. I highly recommend, at least now and again, getting out before sunrise and a few hours before dark to watch the sun set or when the forecast is for sunny spells with scattered showers. You’ll see the world in a new light. 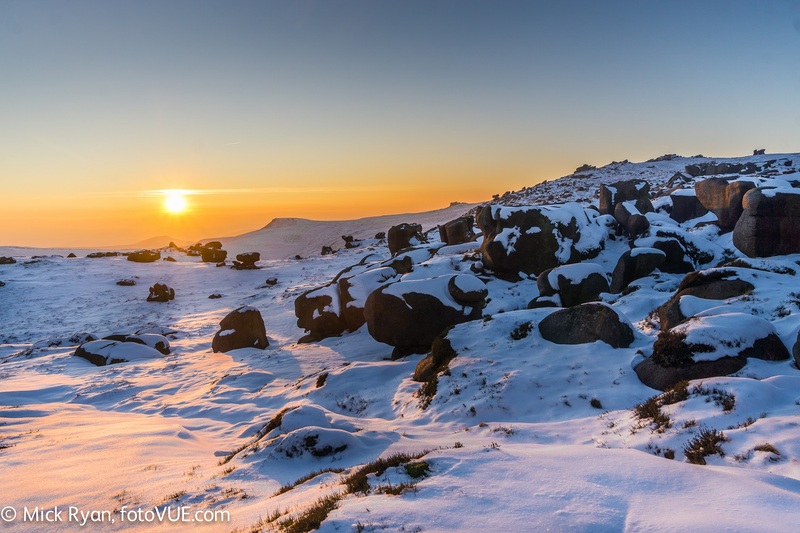 January snow and sunset at the Wool Packs, Kinder, Peak District. Winter sunrises and sunsets are more sociable than summer. 2016. The sensors on modern compact cameras can get results as good as larger and more expensive DSLRs and are light to carry. If you want to get serious recommended are a Panasonic Lumix LX100 or a Sony RX100, both compact robust cameras with a wide-angle zoom lens or my choice at the moment the mirrorless Sony A6000 with interchangeable lenses. For low light photography a tripod is a good idea, although don’t be scared to use a high ISO and hand-hold your camera. Some use filters, I usually don’t, finding that modern cameras can cope with a wide dynamic range of light. Shoot in RAW rather than jpg and post-process in Adobe Lightroom. Check sunset and sunrise times and get into position 3 hours before sunset and an hour before sunrise. Become a habitual user of suncalc.org, metoffice.gov.uk and bbc.co.uk/weather and their mobile apps. Wrap up well, it’s colder at either end of the day. Take a head torch, spare batteries for both your torch and camera, lens cleaning cloths and spare memory cards. A hot drink, and ham and cheese sandwiches are essential to pack.